Mobile payments are an increasingly popular way to accept in-person payments because they’re secure, fast, and convenient. In fact, mobile pay volume is predicted to increase to $503 billion by 2020. Since the growth of Apple Pay and other NFC payments isn’t slowing down, adapting to mobile payment technology is extremely valuable for your business. This guide walks you through everything you need to know about mobile payments—from mobile money transfers to how to accept NFC mobile payments at your business. How can I accept mobile payments at my store? What is a mobile money transfer? Mobile payments are regulated transactions that take place digitally through your mobile device. A mobile wallet is an app that stores your debit and credit card details so that you can pay for things digitally using a mobile device. To use a mobile wallet, a consumer can download a mobile wallet app on their phone and add debit or credit card information which will be stored securely. Most mobile wallets require thumbprint authorization or other security measures in order to access the mobile wallet and pay. Mobile payments are secure, fast, and convenient. Because of their enhanced security features and convenience, mobile payment adoption will continue to increase. Mobile payments (which encompass mobile wallets and mobile money transfers) are regulated transactions that take place through your mobile device. That is, instead of paying for stuff with cash, cheques, or physical credit cards, mobile payment technology allows you to do so digitally. Mobile payments can be used in a “peer to peer” context or for paying at a brick-and-mortar business. In a peer-to-peer mobile payment, you could be making an e-transfer via your bank to, say, pay a friend back for dinner or someone on Craigslist for a piece of furniture. In a mobile payment at a brick-and-mortar business, you’re using an app on your mobile device—instead of cash or a card—to pay for specific goods or services at the checkout counter. In this instance, the business would need a specific type of point-of-sale device (which we get into below) to process the transaction. A mobile wallet is essentially a digital wallet on your phone. In a mobile wallet app, you can securely add and then store the bank details associated with your debit or credit card (some mobile wallet apps allow you to add more than one card). So instead of using your physical card to make purchases, you can pay via your mobile device. If you want to accept mobile wallet payments at your business, you need to have a point-of-sale system that’s equipped with the technology that can process the transaction. The technology that underpins mobile wallet payments is something called NFC, which stands for “near field communication”. NFC is what enables two devices—like your phone and a payments reader—to communicate wirelessly when they’re close together (that’s where the “near” part of NFC comes in). Typically, a mobile device has to be two inches or less from a reader to process the payment. NFC is actually a subset of something called RFID (radio-frequency identification), a technology that allows us to identify things through radio waves. RFID is nothing new—it’s been used for decades for things like scanning items in grocery stores and luggage on baggage claims. Contactless payments have gained significant traction, and more businesses are beginning to accept this secure form of payment. From messaging to transportation apps to health monitoring, we’re using our phones more and more to take care of day-to-day life. So it’s no surprise that we’ve seen a proliferation of mobile payments apps in recent years. A 2015 Accenture Consulting report found that 23% of millennials make a mobile payment at a merchant at least weekly; that number has likely increased since. There are a variety of companies that offer mobile payments apps. But the most popular are Apple Pay (Apple’s mobile payments solution), Android Pay (Google’s mobile payments solution), and Samsung Pay (Samsung’s mobile payments solution). If you have a more recent model of an iOS or Android device, chances are it can support a mobile payments app. On the merchant side of the equation, Square offers a payments processor and system that can accept mobile payments. All you need to start accepting Apple Pay, Android Pay, and Samsung Pay at your business is Square’s mobile payments reader and your mobile device. (Check here to see if your device is compatible—most new iOS and Android models are). NFC, or “contactless,” payments are payments that occur in person between a mobile device and an equipped payments processor. To make an NFC mobile payment, you need to have a mobile wallet app on your device. And to accept an NFC mobile payment at your business, you need a payments reader (like the Square contactless and chip reader). Contactless payments are as secure as EMV chip card payments but have some upsides when it comes to usage and speed. Apple Pay works on the iPhone (version 6 or newer), as well as the Apple Watch. To pay with Apple Pay, add a debit or credit card to the Wallet app on your device. When you’re at a store that accepts Apple Pay, hold your iOS device over the payments reader while holding your finger on the Touch ID button (which is an added layer of protection). Read more about how to use Apple Pay—and accept it at your business. 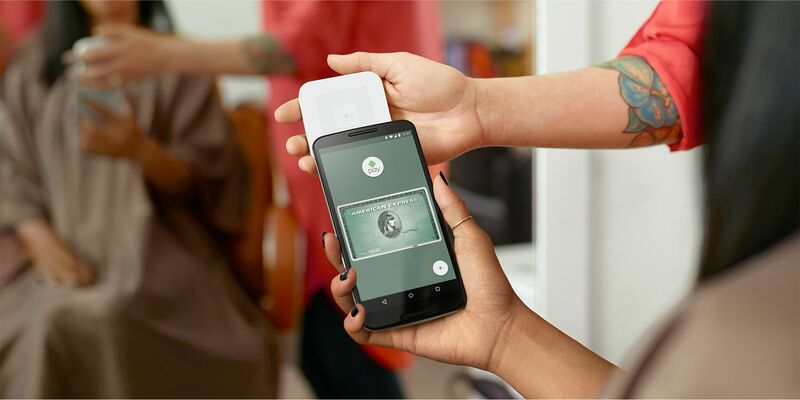 Google’s mobile wallet technology, Android Pay, is available on all NFC-enabled devices that run Android version 4.4 or later. To use Android Pay, open the app on your phone (which requires the user to have a secure lock screen) and complete the transaction by holding your device over the payments reader. To use Samsung Pay, open the app and then hold your device over the payments reader. Samsung Pay works on the Samsung Galaxy S6, Galaxy S6 Edge, Galaxy S6 Edge Plus, and Galaxy Note 5. To pay with your mobile device at a store’s checkout counter, hold your device close to the NFC-enabled payments terminal. The reader should be within 2 inches of the source (mobile phone) to set the transaction in motion. Since there’s no physical contact between your device and the payments reader, mobile wallet payments are often referred to as contactless payments. What’s happening in a mobile wallet transaction is that your device and the NFC-enabled point of sale are essentially talking to each other. Using that specific radio frequency we talked about, they pass encrypted information back and forth to process the payment. This all takes just seconds. Speed, in fact, is one of the coolest parts of NFC payments. They take a fraction of the time of magstripe and chip card transactions—and are leagues faster than cash. Using mobile payments is simple and secure. There’s also something called tokenization at play in a mobile payment transaction. Tokenization is part of why mobile payments are so secure, as the technology safeguards your bank details in mobile payments apps. Let’s take Apple Pay as an example. Here’s how it works: After you take a picture of your credit card and load it into your iPhone, Apple sends the details to your card’s issuing bank or network. The banks and networks then replace your bank details with a series of randomly generated numbers (the token). That random number is sent back to Apple, which then programs it into your phone. This means that the account details on your phone can’t be cloned into anything valuable to fraudsters. To accept mobile payments at your store, you need to get a point-of-sale device that’s equipped with NFC technology. This doesn’t have to be expensive. The Square contactless and chip reader is just $59 and also takes EMV chip cards. Once you get your Square mobile payments reader, it’s super-easy to start accepting Apple Pay, Android Pay, and Samsung Pay right away. All you do is ring up a purchase, look for the green light to appear on the reader, and then have the customer hold the phone over the reader to pay. The whole transaction is completed in just seconds. Learn more about how to get set up to accept mobile payments. 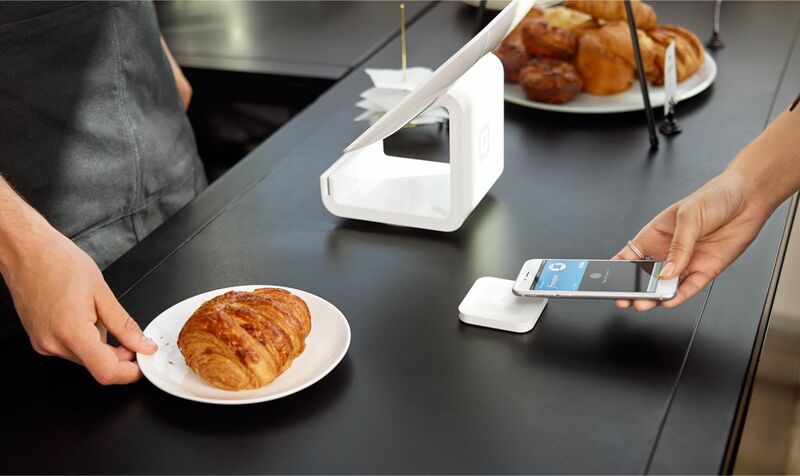 Purchase Square’s contactless and chip reader. For your convenience, consider the OtterBox case for iPhone 7/7s if you’d like to use your reader with your iPhone. You can learn more about setting up the contactless and chip reader here. Download the Square Point of Sale app for iOS or Android. Ring up your customer in the Square app. When it’s time to pay, your customer can hold their mobile device near (within 2 inches) of the reader to complete the transaction. Receive your deposits as soon as the next business day. 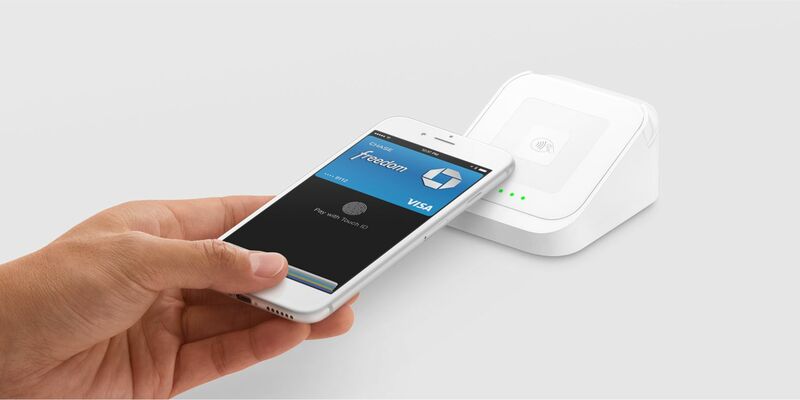 Square sends payments directly to your bank account in one to two business days. Speed and convenience are also strong reasons you may want to consider accepting mobile payments at your business. Mobile contactless payments are by far the fastest way to pay. Usually, they take about a second. They’re a bit faster than swipe payments, and much faster than EMV chip payments, which are extremely sluggish. And for businesses that have checkout lines (QSRs, retailers), contactless payments will become much more attractive as they can move the line faster (which means more sales in a shorter amount of time). People are carrying around cash less and less. People have their phones at the ready more and more. This combination makes mobile payments the most convenient way to pay. There’s no having to go to an ATM to pay someone back—you can do that by sending an e-transfer through your bank’s app on your phone. And there’s no need to dig into your bag for your wallet at the checkout counter—you can just tap your phone to pay. Mobile payments have multiple layers of dynamic encryption, making them an extremely secure way to pay. They’re far more secure than magstripe payments, and just as secure as EMV chip card payments. In fact, if you’re using a mobile payments app with fingerprint ID (like Apple Pay), it’s arguably more secure than an EMV chip card payment. An added bonus for businesses? In a case study we conducted in Portland, Oregon, NFC payments increase tipping rates. Customers who used their phone or NFC device to pay were more likely to tip than customers who used traditional magstripe cards. Here are a few other ways accepting mobile payments helps businesses. The future of mobile payments is bright. Now is the time to future-proof your business. Mobile payments have revolutionized the way businesses are thinking about payments processing. On one front, we’re moving toward more secure, authenticated ways to process payments. And on another, we’re moving toward faster, more convenient ways to pay. Brands like Starbucks and CVS have created apps that allow you to save payment information and favorite products, so you can refill a prescription or order your favorite coffee drink with the tap of a button. Mobile payments check both of these boxes, and therefore are where everything is headed. To accept NFC mobile payments (as well as EMV chip cards) at your store, order the Square contactless and chip reader.